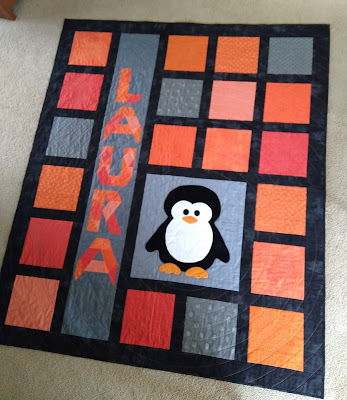 Last month I shared a picture of the penguin quilt top I was making for my daughter in her school colours. I quilted it in time for her to take the quilt on the bus for her spring break band tour to Disney World in Florida but I didn't get pictures of it before she left. Now the quilt (and the daughter) are home so I can borrow it for pictures. I had trouble getting a photo that shows the overall quilting well. 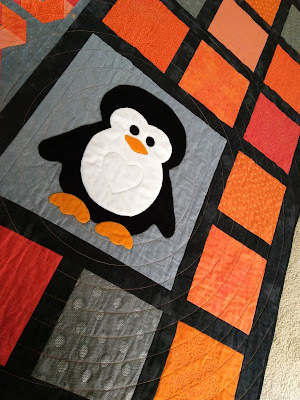 I used my trusty walking foot to quilt concentric circles centered around the penguin. You can see a bit of it in the lower right hand corner above. What my phone camera could not capture at all is the glowing effect of the Sulky orange variegated thread across the greys and black. 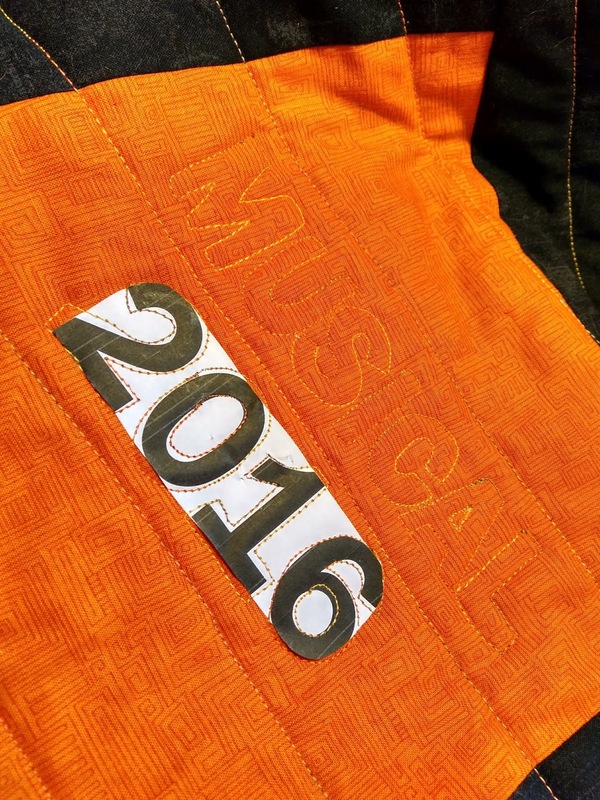 To make the quilt extra personal (because that name splashed across the front is so subtle!) I quilted the names of various school activities Laura has been and is involved with. I typed the words in a large font, printed them, pinned the paper to the quilt and freemotion quilted through the paper around the letters. At first I tried to follow the outline exactly, but that looked pretty shaky, and bits of black ink got stuck under the stitching. Once I started using the printed letters as a general guide things flowed more smoothly. The letters look a little more informal this way too, which I think is a good fit with the penguin. It does say "Fum Fum Fum". That is not a typo for "Fun", though the activity was fun. These are lyrics in one of the songs sung at the high school Madrigal Dinners. 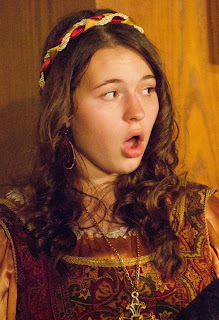 It's pronounced "foom" and as soon as you say "fum fum fum" anyone who has performed in Madrigal knows exactly what you're talking about. So there you have it. The band tour penguin quilt. 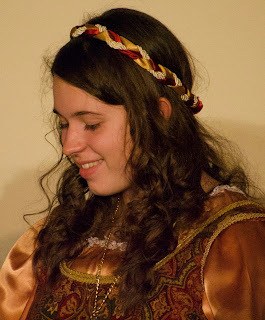 I don't have any photos of the band marching in the Disney World parade during their tour last week, or of the quilt in use on the bus to and from, so I'll leave you with photos from last fall's Madrigal instead. Fantastic memory quilt, and a beautiful girl! ---"Love"
It's a precious quilt with lots of memories quilted in! It is so cute and I'm sure it will be cherished for many years to come. You did a great job! That is a wonderful quilt. I missed all the extras when I saw the quilt the first time. So neat! This is SUCH a fun quilt! I love all of the personal details (including the subtle name)! Very pretty daughter--I think that is great that she is a singer. Lovely quilt and I love the memories quilted into it! Love the heart on the penguin. What a fun quilt. Great way to keep the memories alive, especially stitching the activities into the quilting. 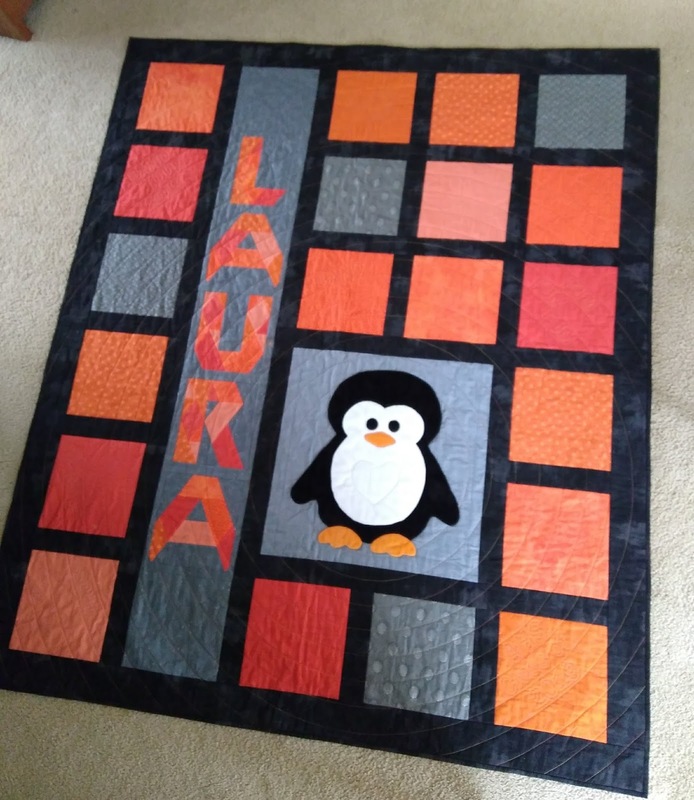 Laura’s quilt is beautiful, and so is Laura. Beautiful quilt and a lovely daughter you have. What a great keepsake to keep her warm and loved while she is at college. 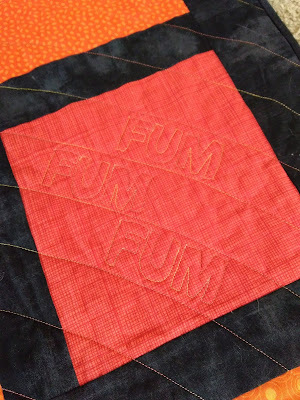 What a great idea to stitch the words into quilt! I bet your daughter was just thrilled with it. 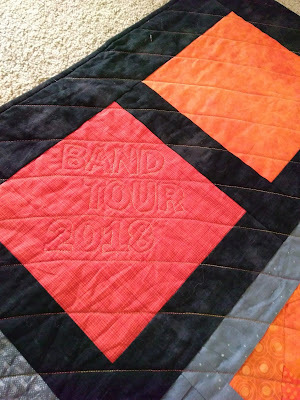 That's a very special quilt indeed. Laura is lovely too.